Sure, we can cook Filipino dishes here like Pinakbet and Pancit because we have Asian stores where we can source the fish paste and noodles. But dinuguan? Now that's something that's difficult to replicate. That's why, when a friend emailed us that his wife will be making dinuguan and that we can order some to take home, we jumped at the chance. It was, needless to say, a highly anticipated dinner. So much so that my wife reminded me that she will no longer cook viand tonight, just rice. And so I arrived home with dinuguan in tow. And a hearty meal we definitely had. Or should I say, we had a bloody delicious meal? Because, for the unititiated, dinuguan translates to pork blood stew and one of its main ingredients is pork blood. It can be unnerving when you think about it, and it sounds like one of the dishes they serve out in Fear Factor. 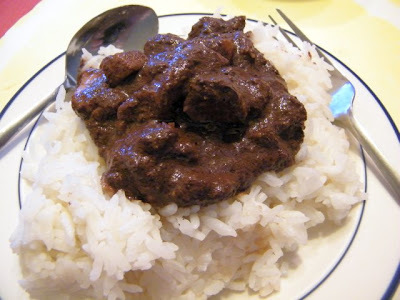 But properly-cooked dinuguan is a truly wonderful dish served with either rice or rice cake (puto). And to have it here is a really nice treat. The fact of the matter is, I've known some non-Filipinos who have come to enjoy this dish as well. But in case you also want some, sorry we only bought enough for a meal and a half :-). We hope there will be another announcement in my inbox soon!